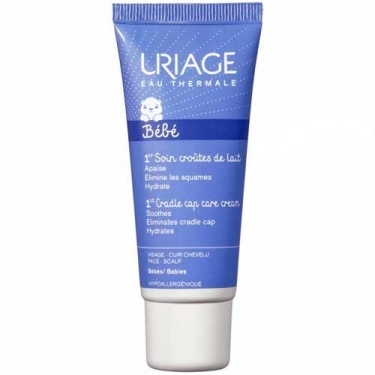 DESCRIPTION: Soin Croûtes de Lait from Uriage is a restful and soothing cream for the face and scalp of your baby. 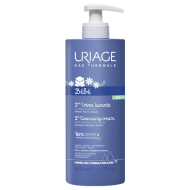 Formulated with Thermal Water Uriage, TLR2-Regul Complex Piroctona Olamine, Glycerin, Shea Butter, eliminates cradle cap, gently regulates the skin flora and soothes scalp irritations. Hypoallergenic and non-comedogenic. Without perfume. 100% improvement of which 70% of milk crust disappeared within 28 days. * * Study carried out under dermatological supervision on 33 children. Clinical studies. Apply in cradle cap with a gentle massage and it leave to work all night. Wash the scalp of the baby the next day in the morning (with the 1er Shampooing of Uriage). Avoid direct eye contact.